following the Islamic jihadist attack on January 28th. An estimated 30,000 ancient manuscripts from Timbutku have been rescued. 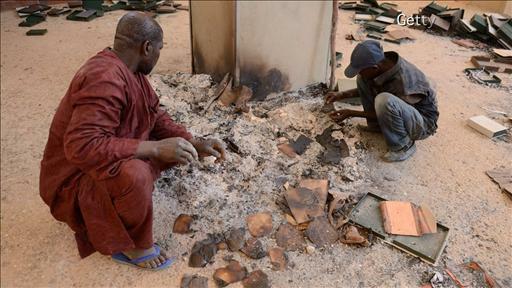 When the Islamic jihadists fled Mali on January 28th they burned the Ahmed Baba Institute, the cities largest library. Yet, unknown to the jihadists the majority of manuscripts secretly hidden and those left behind digitally copied. In fact, the library was almost completely empty. The jihadists stole only a refrigerator, mattress and chairs before burning the library. The majority of manuscripts were hidden in metal boxes beneath mud floors, plastered behind secret walls, and carried out of the country on donkey carts. The effort to protect the manuscripts was spearheaded by private individuals, librarians, and even the library guards. The most amazing account comes from The Wall Street Journal, where it was reported that Alpha Konate hid his ancient manuscripts in Nescafe boxes and filled the shelves of his library with children’s school books. He saved 3,000 manuscripts. 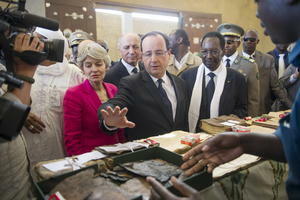 François Hollande survey the damage in Timbuktu. 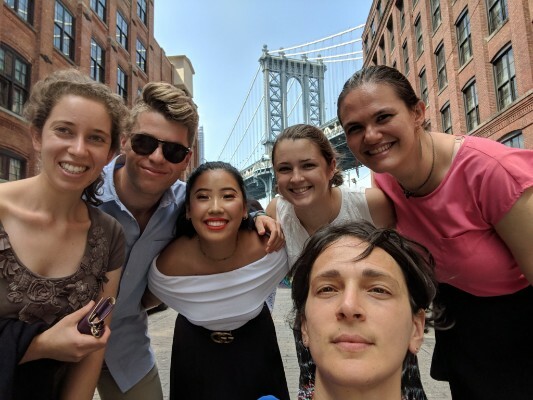 However, immobile cultural heritage in the city was not so lucky. Islamic rebels destroyed statues of saints, mosques, and tombs in their wake, some dating back to the 15th century. The damage may soon be investigated by the International Criminal Court as a war crime. The attacks are reminiscent of the Taliban’s destruction of the Bamiyan Buddhas in 2001. Sources: Drew Hinshaw, “Historic Timbuktu Texts Saved From Buring,” The Wall Street Journal, February 1, 2013; Lydia Polgreen, “As Extremists Invaded, Timbuktu Hid Artifacts of Golden Age,” The New York Times, February 3, 2013 (please note: Alpha Konate is referred to as Konate Alpha); Tristan McConnell, “How Timbuktu Saved its Books: Behind the Rescue of Mali’s Historic Manuscripts,” Harper’s Magazine, February 4th, 2013. Image Sources: Getty and The Wall Street Journal.